There are many things in this world that I love, one of them being my bed. Nothing is better than laying down on fresh sheets and a cozy comforter while stretching out after a long day of hard work. We all sleep...duhhh....but did you know that in order to get a completely restful nights sleep there are a few things that you should and should not do at certain times before hittin the hay? 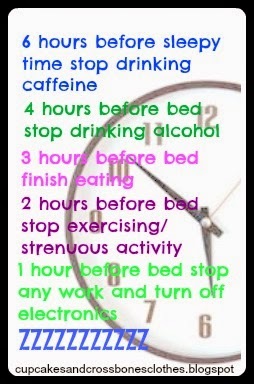 Follow this little guideline and I guarantee you will get a much better sleep than you did last night. What helps you catch some zzzz's? Are you a light or a deep sleeper? great tips! i am a cross between a light and a deep sleeper, lol. it takes me forever to get to sleep unless i am drunk or very very tired. i dont drink caffeine really, dont drink alcohol on the weekdays, hate sleeping when its cold.. eh. everyone is different i guess haha, wish some of these would work on me! Thanks girl! Seriously try the deep breathing one night if you can't fall asleep and let me know what you think. i am forever a light sleeper! I was a light sleeper, now a marching band can come through my bedroom and I won't even know it! I definitely need my cool room and blackout curtains. I also started using essential oils on my feet at night, Vetiver is the -ish. I love that stuff and swear I can tell a difference when I use it and when I don't! oohhh, That sounds like something I would love to try! haha. I hear ya, I feel like I don't get enough sleep either and I actually feel like crap if I sleep late on the weekends because I feel like I missed out on so much of the morning! Great tips! I find I need to be away from electronics awhile before I go to bed. It really helps! Doesn't it!? You don't realize how much it impacts your sleep until you go a night minus the electronics.